Jellycat Bashful Puppy wants to play all day! Her nose is twitching, she can't wait to run. Where should she look for a pawful of fun? 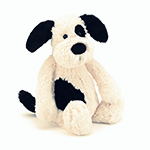 With her smudgy black patch and a sooty tail, silky-soft and lovingly loyal, this bashful pup is even more adorable! Pair it with Jellycats "Puppy Makes Mischief" book (Sold Separately) to make a wonderful Birthday, Baby Shower, or Just Because gift.